I’m already a father. I am custodian and guardian of an immortal creature. I long to see her baptism, which will take place tomorrow; then I will follow, one by one, all her steps, I will see the birth of all the graces of her childhood, and when holding her, I will think that there is in her an immortal soul made for God and for eternity. These reflections move me to tears and leave me confused. Ah, what a moment when, kneeling at the foot of my Amélie, I have seen her last effort and, at the same time, my daughter appear in the light! Frederic Ozanam, July 24, 1845, date of birth of his daughter Marie. The daughter of Frederic —Marie— was born four years after marrying Amélie Soulacroix. Frederic lives the same experience that all fathers and mothers share, the gift of being progenitors, the wonder of bringing a new life to the world. Frederic, from a look of faith, is full of gratitude to God, moved “to tears” by the possibility he has given to accompany, in the years to come, his daughter in human and spiritual growth. 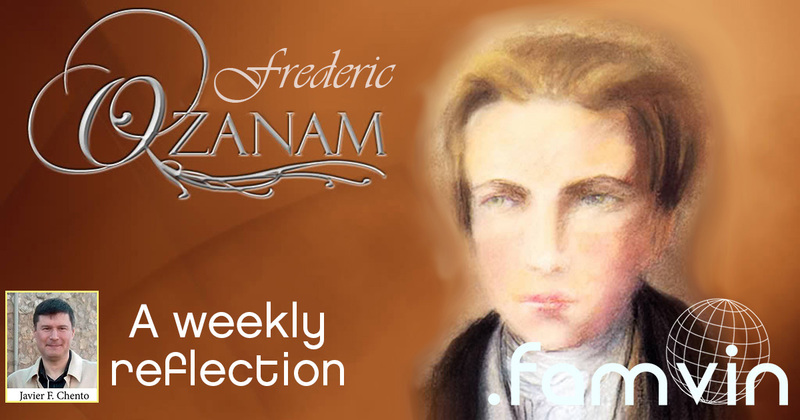 For Ozanam the family was, throughout his life, a fundamental value. Going through the correspondence of Frederic, it is very clear the important role played in his life not only by his parents, but also his brothers and, later, his wife and in-laws, as well as other more distant relatives. Today it seems that the family has entered into crisis. Family values, mutual support, trust between parents and children … seem to be weakened. Likewise, new family models appeared in our society. They are challenges to which Christians also have to give an answer, highlighting, as did Ozanam, the importance of the human being and the duty we have to accompany our children — and also our parents and other relatives — in their life journey. How are the relationships with your closer relatives? If you are a parent: do you worry about the integral growth of your children? If you are a son or daughter: do you care to accompany, love and understand your parents, and help them when they grow older? What should be the position of believers before the family crisis in today’s society?